Every year, P&R has worked with a few non-profit organizations within our local community. We are firm believers in giving back to our local community and have enjoyed working with and helping those in need. 2018 will be no different for us and we are excited to be partnering up with Archangel Alliance! Archangel Alliance is a non-profit that focuses on helping Military service members and their families in times of need. The organization was officially formed in 2015 by Kyle and Joann Snyder of Wake Forest, NC. During Kyle’s first tour to Afghanistan in October of 2012, his squad was approached and attacked by a suicide bomber. His unit lost 3 Soldiers and severely injured 2 – himself included. After this attack, Kyle spent 2 years recovering from his injuries at Womack Army Hospital and Walter Reed Medical Center. He still currently goes thru rehab and surgical procedures as a result of his injuries. Over the course of his recovery, Kyle and his family were assisted by so many! People and organizations came together to make sure the Snyder family was taken care of, fed, and helped as much as possible. The overwhelming outpour of love and support has never been taken for granted and as soon as they were able, Kyle and Joann decided to do whatever they could to assist those in need in the Military. 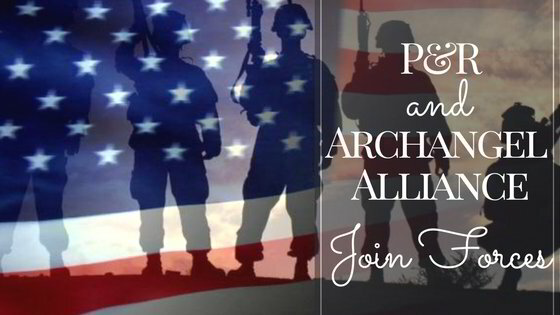 This led to the creating of Archangel Alliance – Veterans Helping Veterans. This organization has been able to help many families make ends meet financially during difficult times, provide Thanksgiving meals to those in need, and they have organized an Angel Tree at Christmas for families in need for the past 2 years as well – just to name a few things! Eventually, Kyle would love to be able to create a program to help homeless Veterans get back on their feet. This could include providing temporary housing, helping prepare individuals for job interviews, and providing a safe and enriched environment for Veterans to get back on their feet. We are excited and proud to be partnering up with this wonderful organization this year to become a part of assisting those who serve(d) our Nation. To kick off this partnership, we will be donating snacks and drinks for an Easter Egg Hunt that Archangel Alliance is hosting on March 25, 2018! You can read more about this event on their Facebook page. If you would like to make a contribution to this organization, you can do so HERE. You can also keep your eyes open for more ways to get involved over the course of this year!